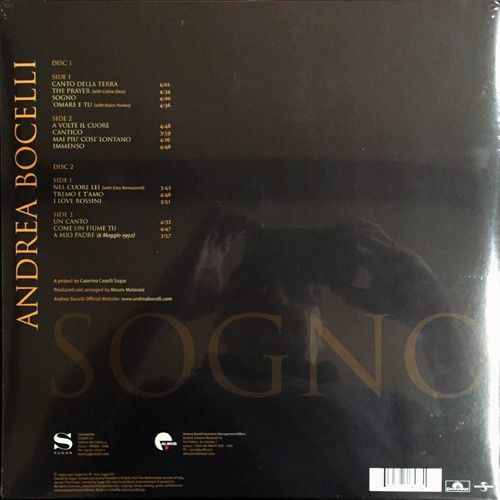 2015 EU reissue on 180g 2LP- Bocelli's Grammy-nominated, double platinum collection Sogno (Italian for Dream) which debuted at No. 1 on the Billboard World Music chart and includes sublime duets with Celine Dion ("The Prayer"), Dulce Pontes ("O Mare E Tu") and Eros Ramazzotti ("Nel Cuore Lei") plus a unique collaboration with the great Ennio Morricone ("Come Un Fiume Tu"). Renowned Italian tenor Andrea Bocelli - synonymous with love and romance - is the most successful classical solo artist ever and one of the best-selling performers in any genre, having sold more than 80 million albums worldwide of both his classical and pop albums. The 7 titles that form his incredible "pop" catalog - Romanza (1997), Sogno (1999), Cieli Di Toscana (2001), Andrea (2004), Amore (2006), My Christmas (2009) and Passione (2013) - were recently remastered with attention to every detail to ensure the highest sonic quality and will be released in a 180g 14LP box set with faithfully replicated gatefold packaging and printed inner sleeves. In correlation with the box set all 7 titles will also be offered individually as 180g 2LP-sets including Bocelli's Grammy-nominated, double platinum collection Sogno (Italian for Dream) which debuted at No. 1 on the Billboard World Music chart and includes sublime duets with Celine Dion ("The Prayer"), Dulce Pontes ("O Mare E Tu") and Eros Ramazzotti ("Nel Cuore Lei") plus a unique collaboration with the great Ennio Morricone ("Come Un Fiume Tu").